April 9, 2019 Ubisoft has offered a tongue-in-cheek reply to Saturday Night Live’s sketch. 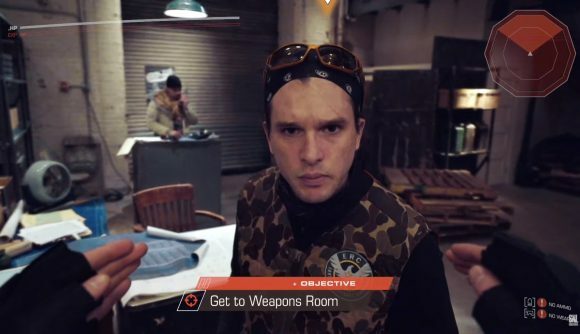 While the game in the skit is the fictional ‘Earth War 3’ and is purportedly about a zombie invasion, it’s pretty obviously a reference to The Division 2. Once Pete Davidson straps on the HTC Vive, he finds himself in a safehouse, where he’s greeted by a gruff-voiced fellow named Damian, played by Game of Thrones’ Kit Harington. Damian explains that the safehouse is where you can “upgrade gear and check progress,” but first Davidson has to reach reach the weapons room, where he plans to get “the biggest gun they have.” It’s all done with The Division-style HUD elements and objective markers, and with the same super-serious tone you generally find in Tom Clancy games. Even the ‘NPCs’ badges look inspired by The Division’s iconography. Unfortunately, Davidson is stymied at each step by another annoying conversation. Even though there’s a button to push to skip through dialog, he finds himself being pulled into the toxic office dynamics of an Earth War 3 safehouse, and eventually abandons his quest to get a weapon before venturing out into the zombie-infested city. I’ve found SNL to be pretty skippable itself for the past decade or so, and I wasn’t expecting much when a friend told me they’d had a skit about The Division 2. But I thought this one managed to hit a lot the right notes – even if it’s not guffaw-level hilarious, the skit definitely is familiar with its subject matter. Ethan, the other NPC featured in the skit, introduces the game’s mission hub – or rather, what will be the mission hub, once he gets done setting it up. It’s pretty clear the SNL writers have been spending some time getting settlements online in DC, and the slightly odd word choice indicates they’ve also completed a lot of videogame tutorials. One note, though: Davidson probably should use the wrist straps on those Vive controllers in the future – just saying.